Latest news: 10 August 2016. A groundbreaking decision support tool that could guide suicide prevention activity and investment both nationally and at a local level is being pioneered by a partnership involving Western Sydney University, The Brain and Mind Centre, The Sax Institute and research consultancy Synergia. 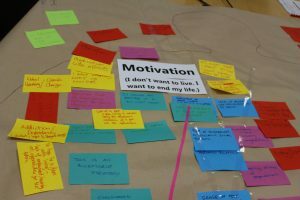 The partnership last month hosted the first of a series of workshops that aim to draw on the expert knowledge of a range of policy, academic and community stakeholders to map the complex problem of suicidal behaviour in Australia. This map, combined with research evidence and a broad range of data sources, will contribute to the development of a dynamic simulation model that makes use of the latest innovations in decision support technology. The model can be used as a ‘what if’ tool, to test to the likely impact of a range of possible suicide prevention interventions, before they are implemented in the real world. The lead investigators on the project are Professor Andrew Page, Chair of Epidemiology at the Centre for Health Research at Western Sydney University, and Professor Ian Hickie, Executive Director of the Brain and Mind Centre. The Sax Institute’s involvement in the collaboration will be led by Jo-An Atkinson who leads Evidence Synthesis and Simulation for Policy at The Australian Prevention Partnership Centre. “This modelling process is unique because it engages community stakeholders, with first-hand experience, in the development of the tool from its inception,” Professor Hickie said. He said the project is ground-breaking because it will deliver an Australian-first national tool that can be customised to provide regional-level decision support capability. That will mean the tool can be used to overcome some of the biggest challenges in suicide prevention including developing locally appropriate and effective suicide prevention strategies; facilitating consensus building for aligning the agendas and activities of suicide prevention stakeholders, and supporting decisions regarding resource allocation despite the complexity of the problem. To date, suicide prevention policies and strategies in Australia have had a limited impact on reducing population suicide rates, Professor Hickie said. There will be wider consultation for the project over the coming months. Find out about other dynamic simulation modelling research being done by The Australian Prevention Partnership Centre.